New Years Eve. Today is the day that I’d planned to have all the Christmas knitting done, no matter what, but as is nearly always the case with my plans, I didn’t quite plan enough. 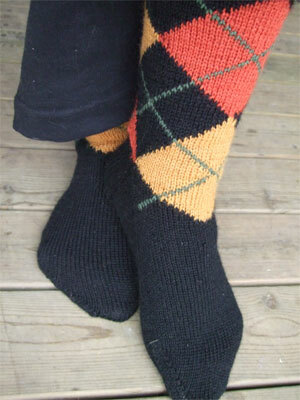 It’s not so bad though, I’ve only got one pair of socks remaining, but we’ll talk about them another day – for today, today we glory in Argyle victory! Finished. Finito. Terminé. Stick a fork in these babies because they are done. Done, wrapped, unwrapped and happily adopted since the recipient has an argyle fetish that these fed nicely. (They are seen here on my feet, which they don’t fit very well.) I was thinking, while I was modelling these that it’s a very good thing that they don’t fit me, because I really like them and probably would have tried to keep them. 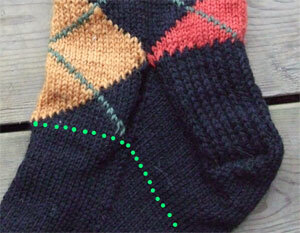 Julia (The Argyle Queen who got me started on the whole thing) has a whole series of posts about argyle, but the most technically helpful one (for the purposes of this post) is here. Julia, in her infinite wisdom has a page of resources here. 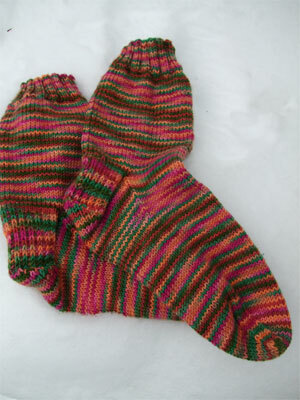 Zarzuela knit a gorgeous pair…there’s some good tips (and great pictures) Here. Knit Science has a podcast about Argyles Here. 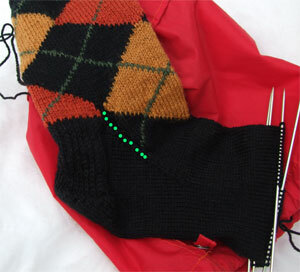 On most socks, heels are worked on half the stitches, so 1/4 of the stitches on each end are set away to become the heel in a little bit, and work continues down the top of the foot. 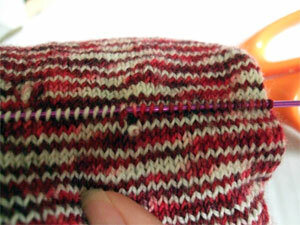 Seam sewn, all of the heel stitches are lined up and I knit an ordinary flap heel. 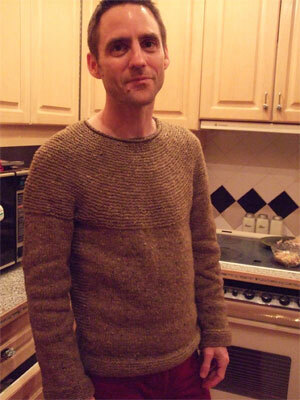 Today I’d like to hear what you think the best thing you knit in the last year was. What was a stellar project…and why? Was it the yarn? The pattern? 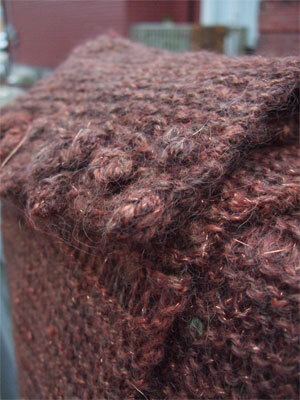 That you learned something good…or that you found out that you’re a much better knitter than you thought? 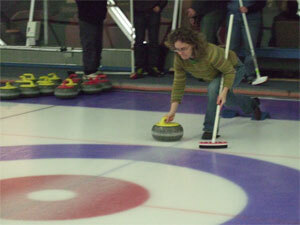 Did you surprise yourself with your skills? and Happy New Year. 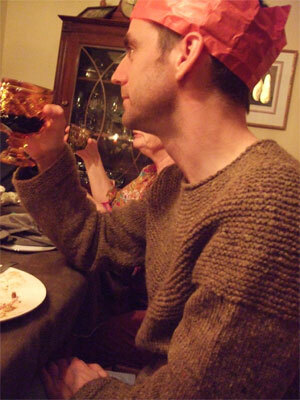 It’s been a great one, and this blog and enormous way it enriches my life has been a big part of that. I think that most people are smarter than they think they are, and that most people know more than they think they do. It is a shame that this sort of theory is mostly proven out by pub quizzes and rollicking games of trivial pursuit, but there you have it. I include myself in this category, since my brain is a huge repository for information – largely stupid and irrelevant information…like the classification of stars or I Picked My Apples Today to help remember the phases of Mitosis – Interphase, Prophase, Metaphase Anaphase and Telophase – which, although it was vital information at one point, is now stuck in my brain for all time for no good reason, using up room that keeps me from remembering where my house keys are. My point, and I do have one, is that you never know what’s up there in your head, until all of a sudden something shakes loose and you remember something that you once passed briefly, or even disregarded as stupid at the time. Such was the case with Elizabeth Zimmermanns afterthought heel. Seldom do I think this of even one word in the great and collected works of EZ, but when I first read about an afterthought heel, I recall deciding (rather firmly) that it was dumbass. I mean, an afterthought pocket? You bet. Damn clever in fact. How many times have you been rubbing your hands down the front of a sweater or something and thought “Crap. As an afterthought, I really wish I’d added a pocket.” All the time, makes total sense. Pockets are optional and sometimes you just don’t know if you will have enough yarn or if you want one or where you want one. An afterthought heel though? I mean, c’mon. 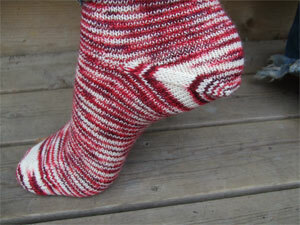 Have you ever been knitting a sock and thought “You know, I just don’t know if I will want a heel on this sock or not. 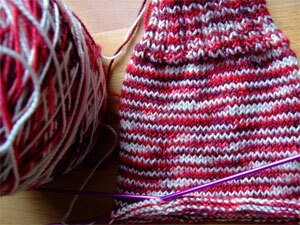 Maybe I’ll just knit a tube and then see if I still have heels on my body when I’m done.” Of course not. See what I mean? Dumbass. I am sure then, that if Elizabeth could have seen me last Saturday night, she would have cracked herself up. 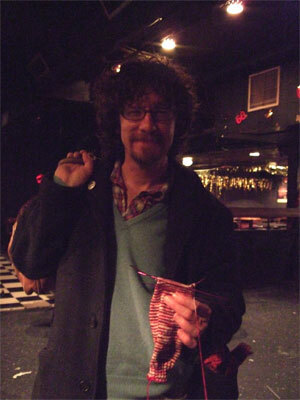 I was on a very tight knitting schedule, but Christmas isn’t Christmas without the Skydiggers Concert at the Horseshoe, so I went, but was going to knit. 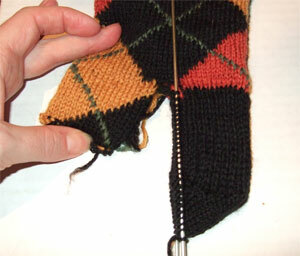 …and chug all the way straight down to the toe and add the heel later. It was brilliant. and start picking up stitches below that too. 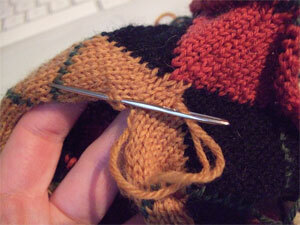 I find it easiest to unpick that middle stitch, and then grab the stitches a few at a time. When you have 32 picked up on the bottom too, then knit another toe. I’m not sure it’s going to ever be my favourite technique for heels, but I have to say, I owe EZ an apology for thinking it was totally dumbass. Another piece of useless information….that turned out not to be so useless. 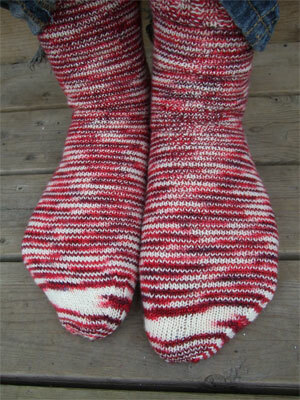 I bought the yarn for these socks from The Unique Sheep and it’s “Verve“, a sock weight yarn in the colourway Doctors Without Borders. 50% of her sales of any yarn in this colourway go to the good guys. Naturally, these are Ben’s Christmas socks, since he is one of the good guys. Christmas around here goes on forever. I’m not complaining, since I’m the biggest fan of the holiday that there is, and if any of you are having half the good time I am, you’re a very lucky person, but I’ve got to tell you, it takes a little out of a knitter. Today is a designated day of rest, and I’m thrilled about it. We enjoyed Christmas Eve with Joe’s family, then Christmas Day was with them as well. Yesterday we had our own Christmas at home (quickly) and then went out to my Great Aunt Helen and Uncle Don’s house (as I have done every single boxing day of my life.) Don and Helen remain the worlds oldest people (you think I’m kidding, but I’m not) and the proud owners of Cricket, the perpetual dog. (Have I ever told you about that? I think I said I would and didn’t. Never mind. Today is not the day.) After that command performance, we went back to my mums, Christmassed is all up again with my family and then retreated to our home, which we lost control of several days ago when I declared the dining room “Wrap Central” to try and keep there from being bows and paper everywhere and somehow there ended up being bows and ribbon everywhere anyway. This place is trashed. Totally trashed – and one of the gifts I got from someone is a cold- so today I shall spend the whole day drinking warm drinks, picking tape off of the floors, recycling wrapping paper and asking people to put away their new underwear. 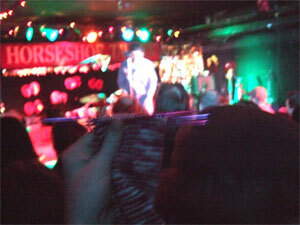 (Note to self – put away own new underwear first so as to be able to lecture from a place of moral superiority.) Maybe I’ll make soup. 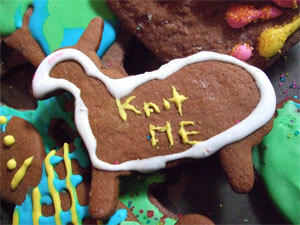 For sure, I’ll knit, since I missed the deadline on one present, and need to bust a move to keep it from spreading. There are two more gift giving occasions, and I am going to be done. Mark my words, I’m on a roll. 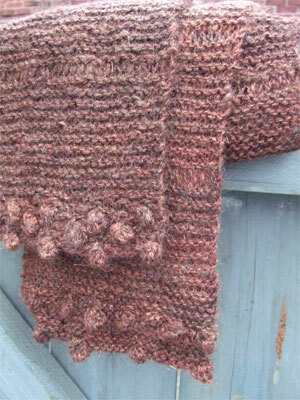 Finished on time: The community scarf for my Mum. 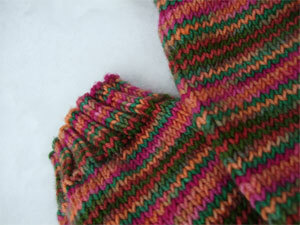 I knit the two bobbley ends, and everybody else took turns churning out the rows of garter in between. 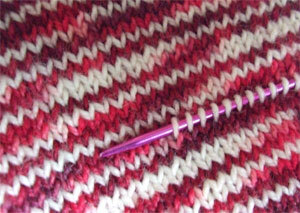 Random rows of double-wrapped drop stitches break up the monotony. Finished on time: The Great Big Secret Thing. 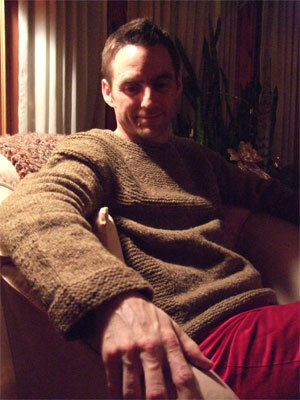 Which turns out to be Ken’s Christmas present, The Cobblestone pullover, by Jared Flood from Interweave Knits Fall 2007. Please forgive all of these photos, our day was so rushed yesterday that all I could manage was to follow Ken around and take pictures of the sweater during festivities at my mum’s. The light was bad. We’ll have a photoshoot another time. In some bizarre turn of events, stash diving for this project I turned up exactly the yarn called for, in exactly the colour. (That means you can click on Interweaves much better pictures or Jared’s much, much better pictures to get an accurate look.) It’s the discontinued Classic Elite Skye Tweed, #1272 (Upland Green) which, I admit I like the looks of more than I enjoyed the feel of the stuff. 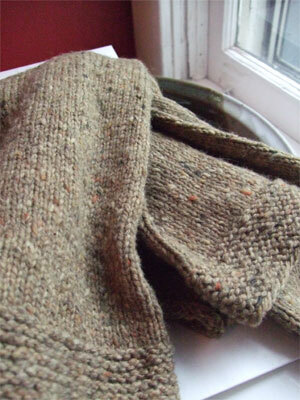 It washed up very, very nice, but while knitting I found it rather rough and really dry and inelastic in my hands. (One person asked if it was cotton.) I knew Ken would adore it when it was done, and I also knew it would be fine after it was washed since I had washed and dried a swatch thoroughly when I first felt these concerns. Still, knitting takes a long time, and generally speaking I’m not going to spend that sort of time with a yarn that isn’t pleasant to work with…..I only broke the rule this time because…well. It was so darned pretty. I’m very glad I persevered. The sweater fits Ken brilliantly…which is another lucky thing. The pattern didn’t have a size small enough to fit Ken the way he likes, so I adjusted the width just a bit, taking out about 4 cm (1.5 inches) of stitches and adjusting things accordingly. 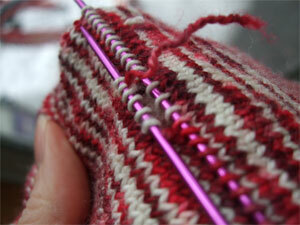 This decision probably also saved my arse, yarn wise. The pattern called for 11 balls for the smallest size….I had 10 and Christmas Eve I finished the sweater with about 15 meters left. Very scary. I think he likes it, and here’s hoping your holidays are going brilliantly well. 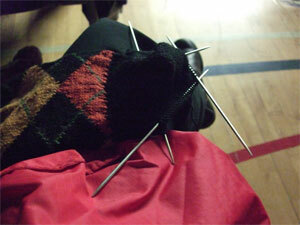 More tomorrow, when I resume the war of the argyles and show what an afterthought heel is good for. PS. 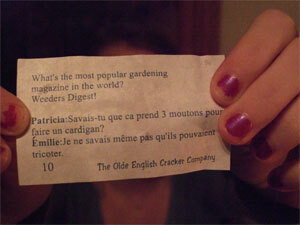 This was the joke in Megan’s Christmas cracker. Patricia: Savais-tu que ca prend 3 moutons pour faire un cardigan? Émilie: Je ne savais même pas qu’ils pouvaient tricoter. 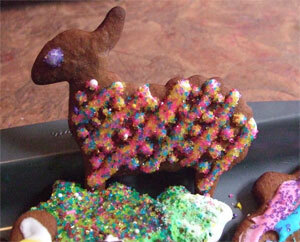 Patricia: Did you know it takes three sheep to make a cardigan? Émilie: I didn’t even know sheep could knit! ….because I am ON FIRE. See that? 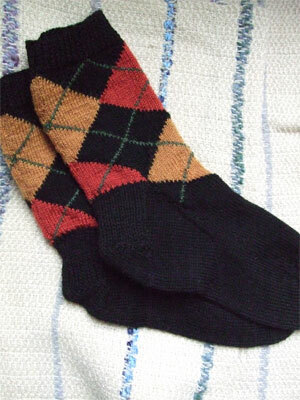 That’s the WHOLE LEG of an argyle sock. The WHOLE THING. (My apologies for the Caps, I’m dreadfully excited.) 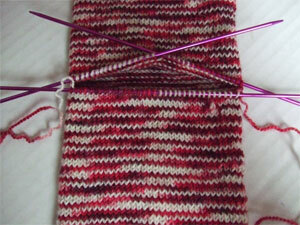 From here, I only have to continue the intarsia down the centre half of the stitches, as the 1/4 on each side get set aside now to become the heel. 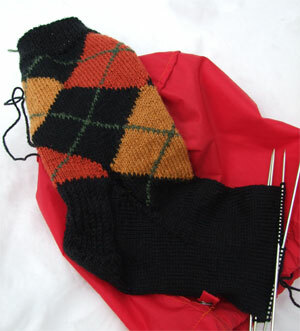 When that centre triangle is complete, then I knit a heel and gussets on those stitches that are at either side, sew a seam up the back of the leg, and the rest is knit in the round, plain black, with no screwing around. I hate to say it…but this might just be possible. (Let us not focus on the other items in the queue which remain unfinished. 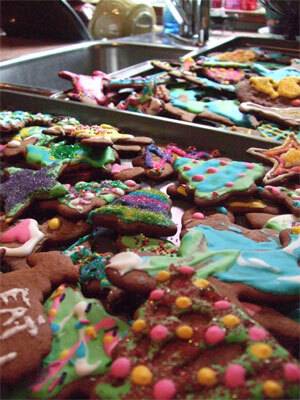 One must have these moments of hope and glory in order to retain a festive feel to the process.) It all seems so possible. Oh yeah. There might be a few ends to weave in. The good news: I am so close to the end of the manuscript that I can smell it. Seriously. It is, in the absence of my computer exploding or something (holy crap. I didn’t even think of that. Excuse me while I go back it up to a cd..) going to be absolutely finished, gone and out of my mind by about 4:00 today. The bad news: 4:00 is exactly the time when the schools release the hounds for the winter break and I will not be alone again (unless you count the bathroom, where frankly, there are no guarantees) until January 7th. Excellent timing on my part. The good news: At least I am not trying to finish a writing project with no time alone, because that is horrible. All I have to do for the next several days is shop (I am trying not to think about that) bake (and only a in a supervisory capacity, see aforementioned detail about school releasing the hounds) clean the house (who am I kidding) and knit,knit,knit. 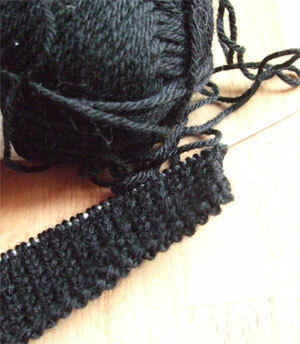 The bad news: There may be more knitting that I can do. Yesterday I accidentally left the great big secret thing off of the list of stuff yet to be done, and while it was rather inspirational to imagine it being done, this albatross is likely the one that is going to drag me to the murky depths of failure. 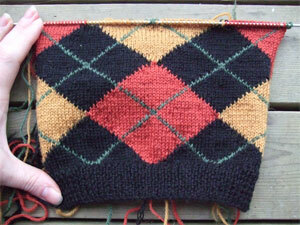 The good news: I got this much done on the argyle. 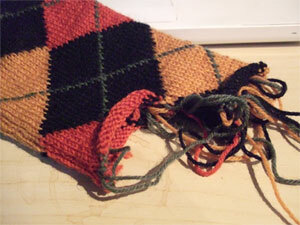 The bad news: I got that much done on the argyle. This part is knit flat, on 2.5mm needles, in intarsia, and while I wouldn’t exactly call it hard…I wouldn’t exactly call it fast either. 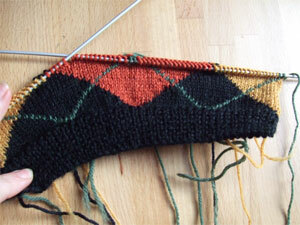 The best thing about argyle knitting is that while there’s definitely a pattern happening, you don’t need a chart. You set up the first row according to the chart, and then you can pretty much get rid of the thing, because the whole pattern moves so predictably from that point on. Oddly, this makes intarsia on tiny needles a good “do anywhere” project – which is excellent, because I see myself doing it everywhere for the next few days. The good news: The sock that had only the barest beginnings of ribbing yesterday is now almost all the way down the leg. The bad news. Not fast enough. All three of the girls have knit on it, I have knit on it, Ken has knit on it….clearly, the reason that it is not finished is Joe. I shall speak to him directly. 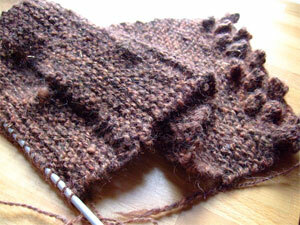 The good news: my sole goal for this entire weekend is knitting, knitting and more knitting. I have purchased egg nog and screech, and procured the second season of Dr. Who to make this possible. I shall fight to the last. The bad news: The last is only three days away. Just a short post today my poppets, since the day is gaining on me and there is much to be done. I’ve a funeral to attend this afternoon, where even I (who can usually rationalize knitting anywhere) cannot find a way to knit and find it appropriate. (Thank you in advance for your condolences, but know that this loss is in my extended family, and that there are others who deserve your sympathy today. You may direct your kind thoughts to my lovely sister-in-law Alison and her family if you wish. 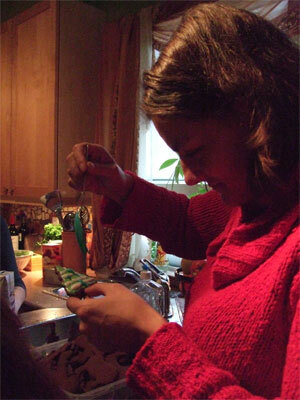 They have lost her sister, a good knitter and a fine human.) I don’t regret the loss of knitting time at all, considering the circumstances. but somehow still expect fully that it, along with a whole other pair of socks (of which I have only the barest whisper of ribbing accomplished) a hat (which is still a skein of yarn) and a manuscript will be finished Christmas Eve. 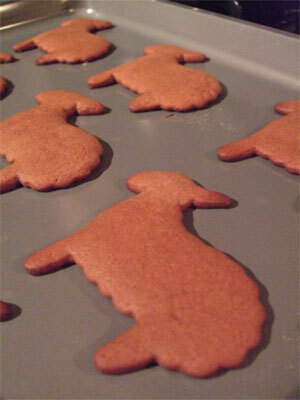 Obviously I have slipped so far into some sort of Christmas delusion that my sense of possibility is all off. 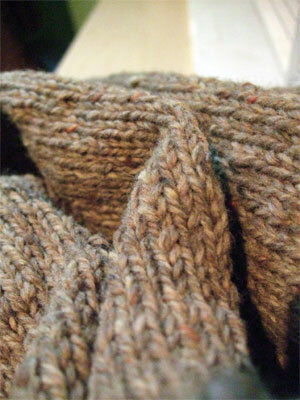 More tomorrow…when we shall examine exactly how much knitting I got done while…not knitting. Since the universe decided to get all complicated on me (and because I have insisted on having a little fun. Big mistake.) I am behind on the Christmas stuff and frankly, there isn’t going to be a recovery. I am not so much of a dummy-head that I don’t know an impossibility when I see it.. so I’ve made some changes in order to survive this with my sanity intact. 2. 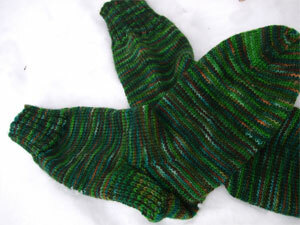 In a very clever move on my part, I dug up some of the step-out green socks from a long time ago, and since they were started already, they took a little less time. 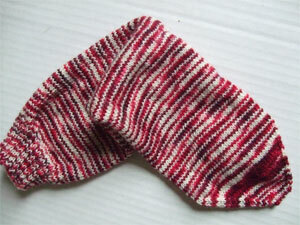 (Fleece Artist, my basic sock recipe.) These didn’t save me a ton of time, since I used the plan to bail myself out last Christmas and all the socks that were really far along got used up then….but I didn’t have to knit ribbing on one, and ribbing and part of a leg on the other (these are step outs 2 and 3, for anybody who cares) so it’s still good times. 3. During a recent shopping mission (In which I went to the mall and scarcely escaped with my life) I just happened to find two wonderful presents. Presents which are, in fact, so good and perfect that they are more likely to be loved by the recipients than the knitting that I was going to do for them. Since I am behind and running out of time, I had the good sense to accept the help the planet was offering me and take those people off the knitting list. 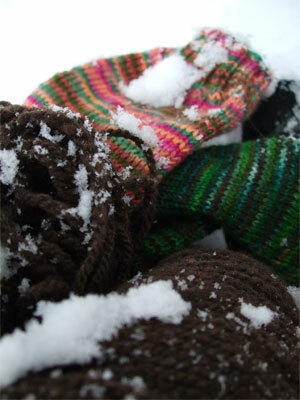 One pair of socks and one pair of mittens bite the dust. 3. 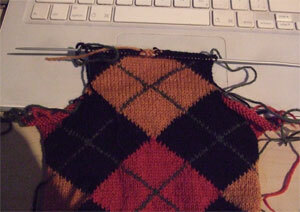 One Argyle sock, almost done. not done. 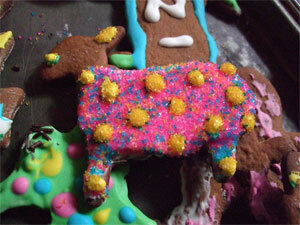 It is 75% done and therefore a bright and festive hope dwells within my heart. Down to business. No screwing around. There are seven days (and nights) left, and I am going to make them count. Pouring on the burn. Watch out. Now, if you’ll excuse me. 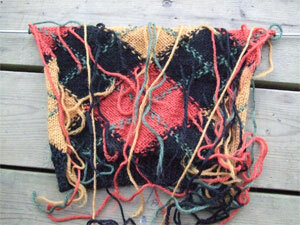 I have to go dry off all my knitting. 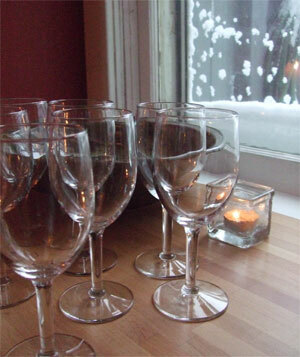 It’s the problem with using snow as a backdrop. The pace here is tremendous. There has been a sad loss in our extended family, I’m still working to meet my deadline (you will note the use of the singular. I am getting things done.) and the knitting schedule has totally gone bust in exchange for the needs of my family. I stood a chance of making up time until I fell down the basement stairs Saturday and lost a full day of knitting time to holding a damn ice pack on my elbow. (I am bruised but not broken, although I do find it ironic that my fall was softened by the enormous load of laundry I was carrying.) With all of the work and the difficult things, this season was starting to be less fun than it should be. When a massive storm started to blow in on the weekend I got really annoyed. There are things I need to get done, there were places that people needed to go and the planet was clearly not on the side of efficiency. I looked out the window, I thought about all of our plans and I got pissed off. Then I had an epiphany. There was nothing I could do. I can’t make there be more time. 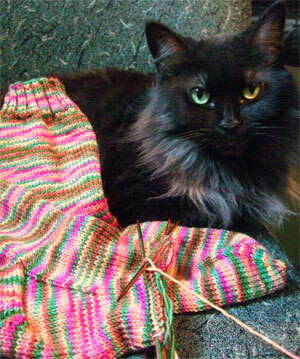 I can’t knit faster. I can’t clear the roads. 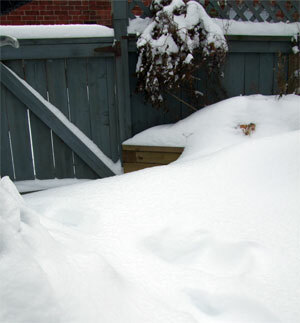 I can’t work harder…I certainly can’t stop the snow. Screw it. I gave up. Just for one day. I took a deep breath. 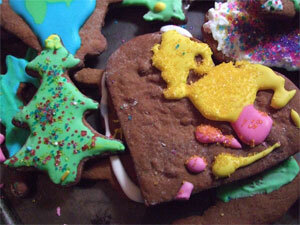 Baked cookies and made five colours of icing. but that we spent a whole day (rather forcibly) unplugged from pursuing whatever mayhem modern life would have us believe is Christmas and its trimmings… and there, buried in the snow, we found a nice big dose of the real thing. 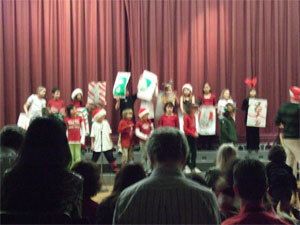 Last night I went to Sam’s Winter Concert. In this neighbourhood, The kids go to a tiny (280 students) school for JK-6, then a larger school down the street for 7 and 8, then High School for the remainder. That middle school goes from JK to 8….though my kids only go there for two years. Sam is in grade 8, moving on to high school at the end of this year, and so it hit me last night as I sat there in the school gym… the aroma of desperate parent all around me….This is the last one. This is the last time that I will sit in an elementary school and wait for my kid to get up and sing or dance or do any of it. The very last time. I thought about that. It turns out that I lack the mathematical facility to tell you how many of these I have been to, but I think it’s a lot. There were the years that it was just Amanda. Her up on the stage, me in the audience with a toddler and a baby, trying to juggle both of them while still waving up at my oldest. A few years later Meg joined Amanda up there, and except for the toddler I had with me, those were the really neat years. Then Amanda went on to middle school and Sam started elementary, then Amanda went on to High School, Meg was in middle school and Sam was in elementary and those my friends…those were the killer years. Three concerts per season. 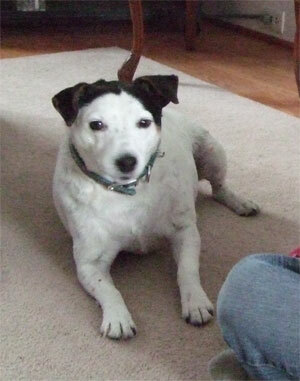 It was during that difficult time that Joe first began calculating how many more we had to do. While the high school band played or the middle school choir sang or the elementary school teacher tried desperately to herd grade ones in and out like unruly sheep, Joe would sum it up. “22 more!” he would whisper conspiratorially, as I tried to appreciate the somewhat melodic strains of…..well. I actually couldn’t tell what song it was, but that’s hardly the point. Back then, with the holidays being what they are and life with kids being what it is, getting out the door to three concerts was a big deal. A very big deal. 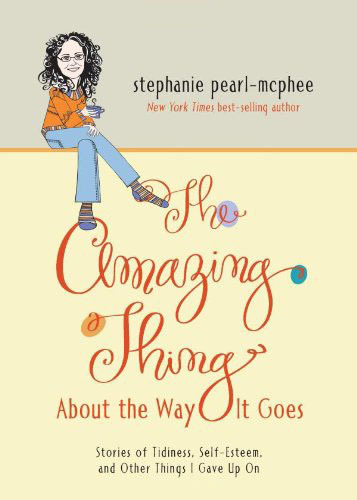 (Actually, life with three little kids being what it is, trying to get your hair brushed by lunchtime was a big deal.) We did it though. Every single one. I have heard “must be Santa” so many times in my life that I feel confident I could perform it. I have developed some sort of coping mechanism for the stunning auditory experience that is a middle school string section. (Mostly, instead of trying to listen I spend that four minutes staring at the teacher and trying to figure out how that is anyone’s job. They are Saints. Heros. Demi-gods of decency. 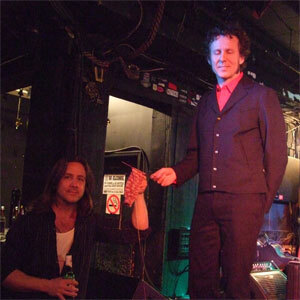 Last night Ken said that if he taught instrumental music he would cry at work. I told him that I wouldn’t cry where the kids would see me, but I might nibble borax sticks in my office after hours. 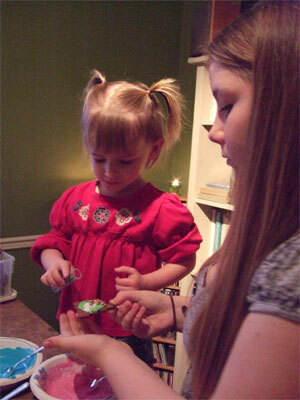 I have no idea what sort of love for children you have to have to do that, for whatever it is, I do not possess it. The squeaky squawking, bleating noise that is the sound of people learning to play instruments is far more than I could bear for six hours a day.) For fourteen years, I have (band pain aside) sat there at least once every holiday season. Fourteen years of counting it down. Last night though…. four more. Four more, and they are all High School Concerts. No more kindergarteners singing “Must be Santa”. No more grade fours forgetting the words to “What a wonderful world”. 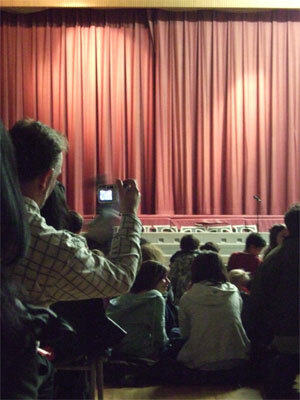 No more of the parents with camcorders rushing up to the stage with a tripod and a big plan. No more of that wee girl in a darling red dress who’s standing and singing in the front row – who then hikes up her skirt and scratches her bum in front of everyone. No more. As I sat there last night waiting for my turn to stand up and wave at Sam in the choir, it turns out that I think I’m going to miss it. My kids are big now, and we’ll go to concerts where the band is pretty good, the choirs are impressive, the string players also belong to orchestras and none of the boys pick their noses in front of everybody during the last song. (Or at least if they do, you hope your daughter isn’t dating them.) I couldn’t believe it. Miss it? All these years I’ve thought that I just could not wait. That I would embrace the new phases my kids went through and I would never feel melancholy for years gone by…and suddenly, last night, sitting there on a crappy chair in that funny smelling auditorium, uncomfortable, squashed, watching a toddler (probably thinking about licking something) wander up and down the aisle, listening to the worst ever rendition of …..well. I still can’t tell what song it’s supposed to be…and I looked around and thought, wow. 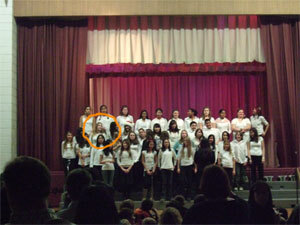 My kids are growing and I’ll never sit at an elementary school concert again…and then I thought the unthinkable. I wonder if the school would let me come back…. Just to watch the grade ones. A thousand curses upon gainful employment for getting in my way. I can’t even begin to tell you how disappointed I am in myself. I am bloody well self employed. If you are self employed, then theoretically you are the boss. (Note that this is not true if you have small children. Then you are not master of your own days no matter who employs you. If you have little kids then the success or failure of your day hinges on the whims of beings who are very small and yet very powerful beyond their means… Sort of like skunks.) Sure, I have contracts and responsibilities and things have to keep moving or we shall starve to death and be homeless, but there is no boss who can make me do things. I am the boss. This means that I should be able to arrange December as a light month…right? All of this is a rather long way of saying “hey look…I have one and a part of a sock instead of a pair of socks.” Also…I think my cat (who refused to budge from her spot) looks rather disappointed with me. 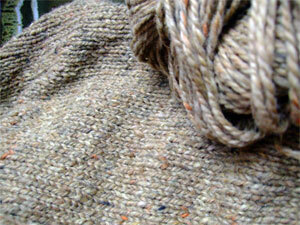 (STR Dixie Chick, mediumweight, my standard sock recipe.) The schedule claimed these should be finished this afternoon for me to stay on track, and they are not, nor will they be. I’m officially behind. I’d promise myself that I would co-ordinate better next year so I can avoid this, but I think that considering I promise myself that every year, it might be a lie. Do you think the planet would notice if we all called in sick to work this time next year and took a week off to sit around in our jammies, drinking hot tea and knitting? I won’t tell if you won’t.